After dough rises, turn out dough on flour-dusted counter and push out the air. Cut in half and shape into two 9-inch by 12-inch rectangles. Sprinkle half the cinnamon and raisins over one rectangle and the remaining half over the other rectangle. Fold each rectangle starting with one end and folding the dough over itself 3 or 4 times, folding the corners in toward the center. Place each loaf into a greased 8-1/2-inch x 4-1/2-inch x 2-3/4-inch loaf pan, cover with plastic wrap, and let rise until doubled, about 1 hour. Preheat the oven to 375°F. Separate the remaining egg and combine the yolk and 1 Tbsp. water, beat lightly with a fork. Remove plastic wrap and brush the loaves lightly with the egg wash.
Bake loaves for 30 minutes, or until bread is golden brown. Internal temperature should be 190°F when done. 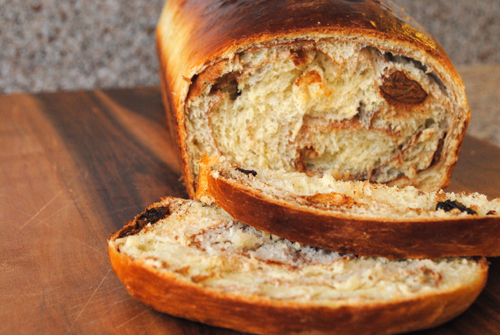 i remember this yummy bread as it was at The Glen Mor… sooooo good.